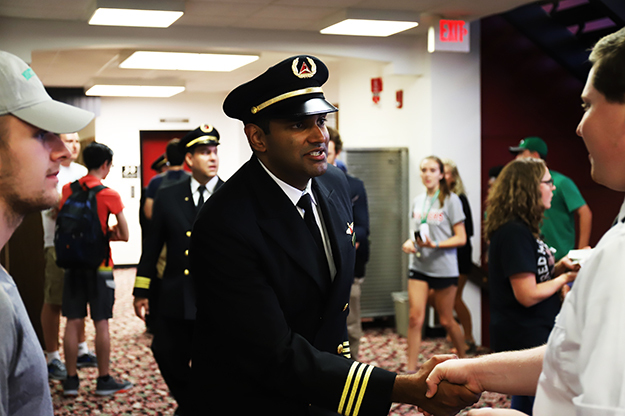 Ashish Naran, a Delta first officer and outreach manager for community programs, met with students and answered their questions as part of the legacy carrier’s UND stop, announcing a new pathway program for the next generation of airline pilots. UND is one of eight universities in Delta’s initial run of the program, called Propel. Photo by Connor Murphy/UND Today. Dean Paul Lindseth took the podium Thursday evening welcoming students back to campus, reminding them it has been 50 years since John Odegard founded UND’s prestigious aerospace program. He said the aviation trailblazer must be smiling down on them as the School of Aerospace Sciences creates yet another partnership with a major U.S. airline. Delta’s Propel Pilot Career Path Program will help the airline identify, select and develop the next generation of pilots. Starting with eight universities, including UND, Delta’s goal is to provide a defined, customizable and accelerated path for juniors, seniors and recent graduates to reach the Delta Air Lines Flight Deck. Those eligible have until Sept. 5 to apply. Close to 800 students attended the Chester Fritz Auditorium event this past Thursday. 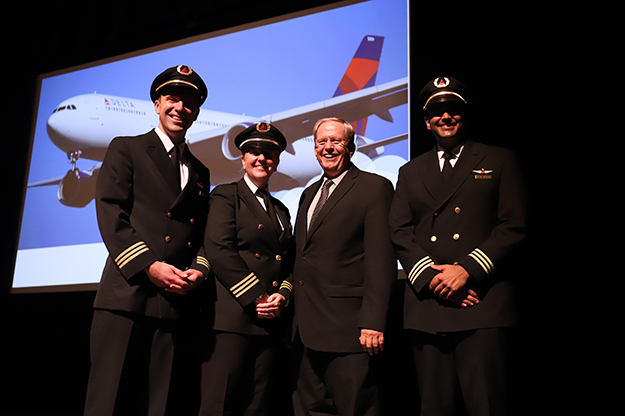 After the presentation from Delta’s outreach team, students gathered in the auditorium’s halls to speak with UND alumni and Delta pilots to learn more about the career. Photo by Connor Murphy/UND Today. 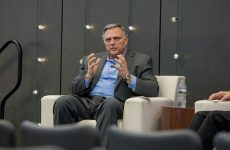 Over the next decade, around half of Delta’s current pilot workforce will reach the age of mandatory retirement, says Brent Knoblauch, 717 first officer and pilot outreach manager for Delta’s campus programs. The airline expects to hire 8,000 pilots during that period. For the past four years, the airline visited nearly 30 universities, met with hundreds of students in focus groups and worked with administrators and faculty to understand their needs as aviation educators. The result is Propel building on Delta’s current pilot recruitment structure. Knoblauch calls it a new “on-ramp” that provides college-aged pilots with four crucial components. When a student successfully applies for the program and makes it through Delta’s own testing and interview process, they’ll receive a qualified job offer with Delta Air Lines. Knoblauch notes that it’s among the greatest benefits of the program, because it’s a commitment on Delta’s part to expedite the student’s progress to Delta Air Lines. Propel also offers a customized approach unlike any other airline pathway program. There are three means by which to progress from college graduation to piloting for Delta. Flying for one of Delta Connection’s carriers is the first, and traditional, option. These are the airlines that connect major hubs to smaller, regional airports. Students in the program can alternatively elect to work with Delta Private Jets in a job share setting: flying corporate aircraft for a set number of days, then returning to Grand Forks to work as an advanced Certified Flight Instructor in a cyclical schedule. 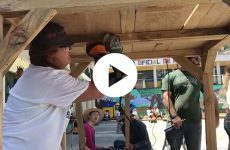 It’s a route that both “feeds the pipeline” and has graduates giving back to their alma mater. Propel’s third route to piloting for Delta is by joining a reserve guard outfit. Knoblauch says Delta will assist students in finding a unit that will hire them as pilots. Each of these three paths, by way of a qualified job offer, have the same timeline – a maximum of 42 months to complete at least 1,000 hours of turbine flight time (750 for the military route). Ashish Naran, another outreach manager with Delta, says it’s quite an advantage to have such an expedited, organized route to being a commercial pilot. Finally, Delta is committed to providing mentorship to its Propel applicants. Every semester, Delta Days will be a time for experienced Delta pilots to answer questions, give technical/career and lifestyle presentations and teach UND students about the career, on campus. Every student in the program will receive an active Delta pilot as a mentor. “There are so many decisions in this career, to have someone to talk to at Delta is an incredible benefit and something important to provide for students,” Knoblauch said. (From left to right) Brent Knoblauch, Emily Coaker, Aerospace Dean Paul Lindseth, and Ashish Naran pose after announcing the Propel Pilot Career Path Program. The Delta outreach team of Knoblauch, Coaker and Naran says UND meets all criteria to effectively address their need for 8,000 pilots over the next ten years. Photo by Connor Murphy/UND Today. The outreach team says UND was selected for the initial run of Propel due to its satisfaction of a long list of factors. 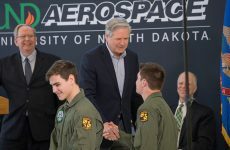 Primarily, they think UND produces leaders – exactly the type of graduates Delta wants leading the next generation of mainline pilots. 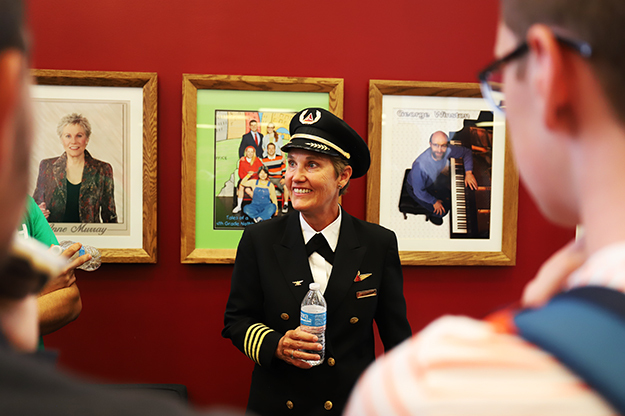 “This is a university we value not only because they develop a professional in the cockpit, but also outside of the flight deck,” said Emily Coaker, assistant manager to pilot outreach programs. Naran added that UND has an impressive track record. Hundreds, if not thousands, of UND graduates are currently employed by Delta. The 800 students at the Chester Fritz Auditorium on Thursday was the biggest turnout the outreach team has had yet as they travel around the country, kicking off Propel’s programming. Earlier this year, UND announced a pathway program with United Airlines.